Lahore (March 03, 2018): Punjab Law Minister Rana Sanaullah said on Saturday that Pakistan Muslim League-Nawaz’s victory in Senate elections proved that Nawaz Sharif cannot be subtracted. Speaking to media outside Punjab Assembly, the provincial minister said his party’s victory in Saturday’s elections is Nawaz’s triumph. “It was in accordance with the PML-N’s majority in Punjab and without horse-trading,” he said. 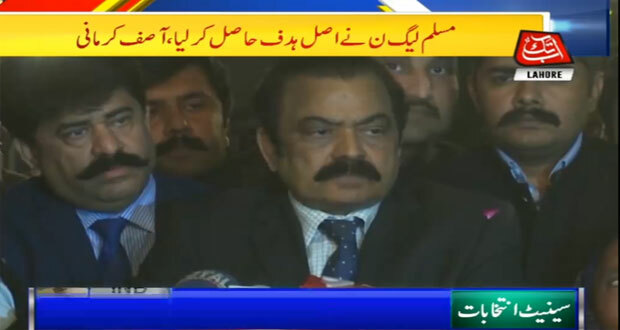 Rana described the successful conduct of Senate elections as “democracy’s victory and defeat of its enemies.” PML-N backed independent candidates secured 11 out of 12 seats from Punjab, however, one seat was secured by Pakistan Tehreek-e-Insaf’s Chaudhry Mohammad Sarwar. “I thank Tehreek-e-Insaf, Jamaat-e-Islami, independents and all friends, who voted for me in the Senate elections,” Sarwar said while speaking to media after winning Senate seat. PML-N’s Asif Kirmani said they would investigate as to how Sarwar was elected as senator. “PTI did not have enough votes [to get Sarwar elected]. We will find out the names of PML-N members who switched sides,” he said. Kirmani vowed actions against the ones found responsible.